The French had even less success in the other sectors between Vailly and Reims. To the right of the G.K. XV. b. R.K. the 5. G.I.D. lost little ground and to the left the 10. R.D., southeast of Berry au Bac, in position behind the Aisne canal, threw back the enemy attacks in their sector. By Loivre, the sector of the 21. I.D. saw the enemy attack in the foggy morning, crossing the railway to the west of Bermericourt. Leutnant Lidl of the 9./b.R.Fussartillerie Regiment 3 saw them from his advanced observation post and was able to alert the unsuspecting Prussian gunners in time. Their fire tore through the French ranks, stopping their advance and holding them until the infantry arrived. On the evening of the 16th April the A.O.K. 1 arrived to take over the sector from Juvincourt to Auberive (east of Reims). The 5. b.R.D. transferred to the A.O.K.1, coming under the command of the Generalkommando of the Gardekorps. Above: The continuation of the battle. In the night of the 16th and morning of the 17th April the French attacked numerous times trying to force the gap made between the Miette and Aisne. The 5. b.R.D. and 50. I.D., their troops hopelessly mixed together, threw back each enemy attack. The German artillery in the sector, having lost eight batteries and having barely had time to set up in the second line after their withdrawal, fired bravely, helping put a damper on the enemy's desire to advance. The 213. I.D., with elements of the 50. I.D. and 5. and 9. b.R.D., were ordered on the morning of the 17th April to retake the western bank of the Miette. From the heights to the south they received such heavy fire that the G.K. XV. b.R.K. ordered them to break off the attack. The A.O.K. 7 approved the request to pull the 9. b.R.D., who had had a relatively quiet 17th April, back to the artillery positions southwest of the Corbeny-Juvincourt road. The b. R.I.R.11 managed to pull back that night with nothing special to report. The b. R.I.R.14 and b. E.I.R.3, however, before they could leave their positions in the Viller Wald, were hit with an enemy night attack. The enemy attacked from the Miette banks along the Road Berry au Bac-Corbeny fighting their way to la Musette before the advance was stopped. Only two battalions of the b.R.I.R.14 and parts of the b.E.I.R. 3 were able to retire that night. The artillery positions were secured by elements of the 9. b.R.D and 213. I.D. The b.E.D. on the night of the 17th April, supported by elements of the Prussian I.R.74 had thrown back another enemy attack. 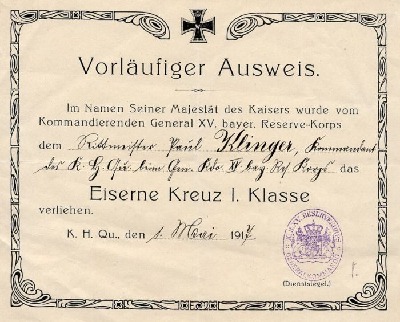 Left: The Iron Cross 1st Class document awarded to Rittmeister Paul Klinger, officer commanding the staff of the Gen. Kdo. XV. bay. Res. Korps. From the 18th the sector was relatively calm. The enemy tried numerous local attacks, but achieved little. On the 18th of April the 21. R.D. and 54. I.D. counterattacked from the area northeast of Juvincourt to attempt to throw the enemy from the captured artillery positions between the Miette and Aisne. The artillery support was provided by the 5. b.R.D. with detached batteries from the 9. b.R.D. and 213. I.D. The attack failed and led to a even more confusing mix of units of the 21. R.D., 50. I.D. and 5. b.R.D. between the Miette and Aisne. A French attack on the 19th was beaten back in this sector. The enemy did not leave the exhausted b.E.D. in peace either. The b.E.D. and b.R.I.R.14 were dug in on the northern edge of Craonne, a large impediment to the enemy who had its eye on the „Winterberg“ (Plateau de Californie) which towered 100m above the plain and Juvincourt. Neither the heaviest artillery nor the attacks of French infantry managed to eject the Bavarians from their positions. From the 18th the sector was relatively calm. The enemy tried numerous local attacks, but achieved little. On the 18th of April the 21. R.D. and 54. I.D. counterattacked from the area northeast of Juvincourt to attempt to throw the enemy from the captured artillery positions between the Miette and Aisne. The artillery support was provided by the 5. b.R.D. with detached batteries from the 9. b.R.D. and 213. I.D. The attack failed and led to a even more confusing mix of units of the 21. R.D., 50. I.D. and 5. b.R.D. between the Miette and Aisne. A French attack on the 19th was beaten back in this sector. The enemy did not leave the exhausted b.E.D. in peace either. The b.E.D. and b.R.I.R.14 were dug in on the northern edge of Craonne, a large impediment to the enemy who had its eye on the „Winterberg“ (Plateau de Californie) which towered 100m above the plain and Juvincourt. Neither the heaviest artillery nor the attacks of French infantry managed to eject the Bavarians from their positions. On the 18th of April the G.K. XV. b.R.K. was relieved by the G.K.65. The hour of relief for the Bavarian divisions was near at hand as well. On the 19th of April the 9. b.R.D. handed command of the artillery position to the west of Juvincourt to the 213. I.D. and on the next day the b.E.D. began to give its positions over to the 28. R.D. while the 21. I.D. began to relieve the confused mixture of 5. b.R.D. and 50. I.D. units. The three Bavarian divisions spent a few days behind the line as a counterattack reserve. On the 23rd April the 5. and 9. b.R.D. moved to the area between Rethel and Mezieres, followed by the b. E.D. on the 26th. From here they were sent to quieter areas, the 9. b.R.D. to Lorraine, the 5. b.R.D. and b. E.D. to the area between the Maas and Mosel. The 5. b.R.D. had lost 85 officers and 2900 men, the b. E.D. 45 officers and 1700 men. The artillery battle retained its intensity. Between Laffaux and Auberive it increased to an unheard of intensity by the end of April. Numerous reconnaissance patrols and local attacks pointed to the possibility of a new offensive and the awaited attacks came on the 30th of April and fourth of May on both sides of Rheims and on the fifth and sixth of May between Vauxaillon (northwest of Laffaux) and Juvincourt. The German troops held firm. The Winterberg, however, which had been successfully defended by the b. E.D. (b. R.I.R.4) in April, was by now partially in the hands of the enemy. 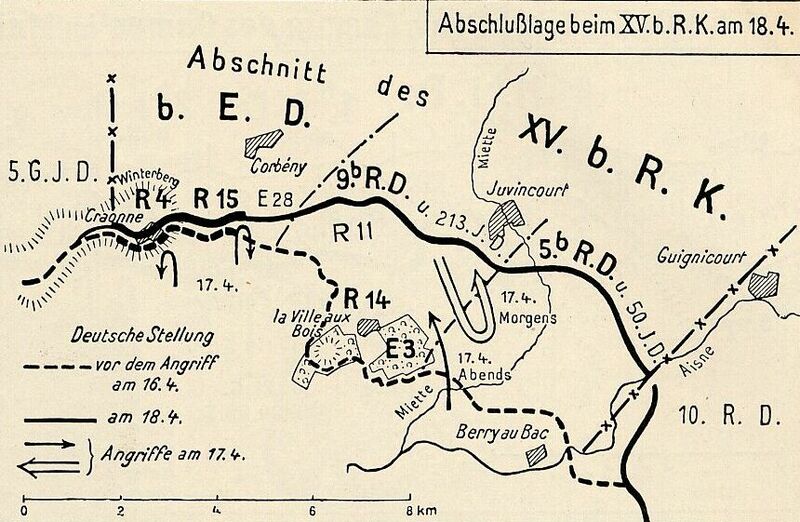 In a number of places to the west the German troops had been pushed rearwards from the Chemin des Dames to the Ailette. It was into this cauldron that three new Bavarian divisions were sent to relieve the exhausted troops between Courtecon and Craonne and to secure the endangered slopes.